If you are interested in creating a habitat garden, a garden that fits seamlessly into your local environment and is welcoming to local wildlife, this is a book that can help you achieve your goal. 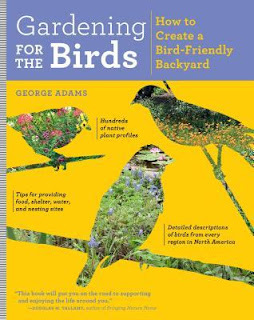 George Adams' emphasis is upon attracting birds to the garden, but, in fact, his gardening method will also attract butterflies, bees, and other pollinators, small reptiles and amphibians, as well as avian visitors. It will be a place that is welcoming to them all and that is much more interesting for any humans that spend time in it. One of the most popular hobbies in the country is feeding birds. An entire multi-million dollar industry has grown up around supplying feeders and feed to the hobbyists, but putting up a bird feeder in your yard is not necessarily the best way to attract birds or to attract a wide range of species. You might wind up with nothing but House Sparrows, which is not what most people who want to watch birds in their yards are aiming for. A better approach is to actually put in the effort to create the kind of habitat that the birds are looking for. The author advises us to look at our yards from a bird's eye view. When we do that, we can begin to see that a bird-friendly landscape is what they are seeking. They want plants that are familiar to them, plants that provide food, shelter, and a place to raise their young. And, of course, they want a source of clean, fresh water. To attract birds to your garden, the backbone of your landscaping plan should be local native plants. By putting in native plants and using an organic, sustainable approach to gardening, you establish a balanced ecosystem in your yard. A greater variety of birds and butterflies will visit and linger, insect pests will be kept under control by insect-eating birds (reducing the need for harmful insecticides), and the wonder of nature will be part of your everyday living environment. That is a succinct summary of the philosophy behind this book and the philosophy behind habitat gardening in general. It is one that I subscribe to and try to put in practice in my garden. Adams explains that when you use native plants, plants with which birds and other wildlife are familiar, you will be mimicking their natural ecosystems. In doing so, you will provide birds with food, water, shelter, and nesting places, so that, instead of simply visiting and passing through, they will linger. They will call your garden home and you will have the bonus of observing them, up close and personal. This book provides helpful calendars which list native plants from each region of the country. The calendars show the light needs of the plants, which animals make use of them and which months they will bloom, as well as other useful information. There are calendars for hummingbird and butterfly flowers, wildflowers, and for seasonal fruiting. The author shows how to develop your landscape plan, according to the properties of your own particular region. He shows that even small garden spaces can create friendly habitats for birds. He also discusses some of the problems which may arise - things like nuisance birds such as House Sparrows and European Starlings, cats, and the unwelcome guests like rats and mice that bird feeders can sometimes attract. Finally, there is a substantial plant directory, covering more than one hundred pages, which lists native plants from all sections of the country and their needs, as well as some of the birds they may attract. And there is a cross reference directory with profiles of the individual bird species, featuring wonderful pictures, which gives information about their preferred habitat and their behavior and, most importantly, what plants you can plant to attract them. This book, in short, gives a helpful but not overwhelming amount of detail regarding the horticulture of the plants and the garden design strategies. 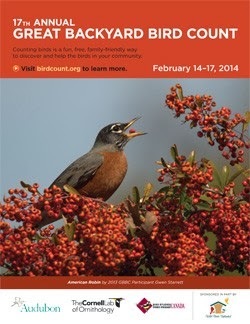 It features wonderful pictures of plants and birds that should be useful to both the birding and non-birding gardener. And the charts are well-organized and easy to understand. It is a book that provides a primer for anyone who is interested in creating a bird-friendly habitat in their yard. It should find a place on the bookshelves of gardeners and birders alike. And, yes, they are quite often the same people. Does this sound like a book you would like to have? Well, this may be your lucky day. The publisher is offering a chance to win a free book as well as a framed pen-and-ink bird illustration done by the author. Just click on the link and enter. All it takes is an email address. Good luck! Update 08/28/13: I'm linking this post to the Wildflower Wednesday meme at Gail's Clay and Limestone blog. Visit Gail to see a list of other posts about some of our wonderful and interesting native "weeds." If you are a person of a certain age, you may remember the summer of 1969 when Neil Armstrong took his "giant leap for mankind" on the Moon. Around that same time, there was a song that was very popular and was getting a lot of play on the radio. It was called "Poke Salad Annie" and told the story of a poor Southern girl who picked a wild plant called pokeweed and cooked it as a vegetable. Annie, however, would have actually called her vegetable "poke salet." It is a vegetable that many poor Southerners were then, and probably still are, very familiar with. It is properly known as pokeweed (Phytolacca americana) and it grows wild and rampantly in the eastern United States. It is a member of a family of perennial potherbs that are native mostly in Africa and the New World. 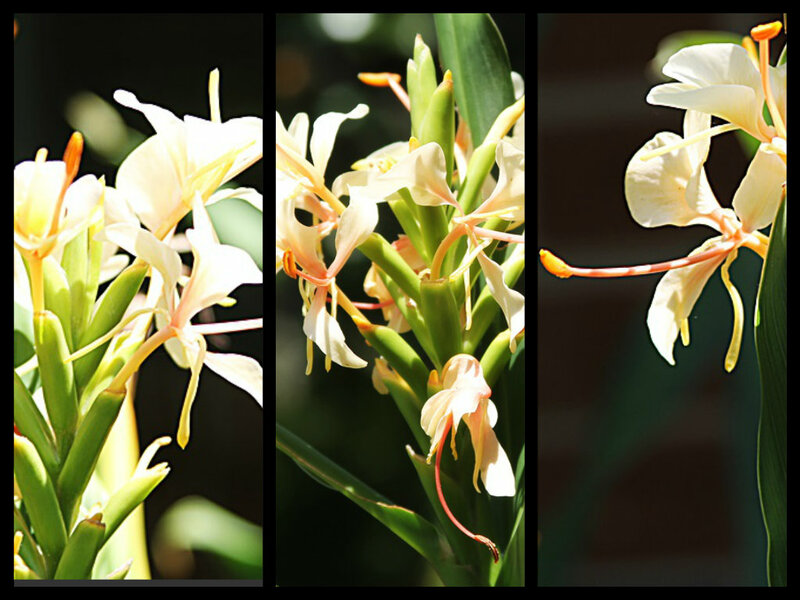 The plant's name supposedly is derived from the Algonquian word "pakon" or "puccoon" which referred to a dye plant. It is also sometimes spelled "Polk" and its leaves were adopted as symbols in the political campaigns of the 11th president of the United States, James K. Polk. The funny thing about this plant is that the young, tender leaves which are used as a green vegetable like spinach are highly toxic. Anyone who wants to eat it must be very careful to handle it properly or their meal could wind up making them very sick. The leaves must be boiled twice and the first water discarded. In spite of the labor-intensive preparation needed, many people do look forward to picking those first leaves that poke out of the ground in spring. And, in fact, in some specialty markets, you can even find the canned, preserved leaves prepared and ready for you to eat. The Allens use the traditional Southern spelling of the plant on their cans. Several years ago, pokeweed got started as a weed in my garden, probably planted there by a birds. The berries of the plant are greatly loved by birds, and since I love the birds, every year I leave one or two of the plants to grow in my garden. From those tiny, dark green leaves that first poke out of the ground in the spring, the plant will grow rather quickly into a robust shrub. The one that is growing in my backyard this year is about eight feet tall and just as wide. This is the rangy pokeweed shrub in late August, many of its ripened berries already stripped by the birds. The berries don't last long once they ripen. You can see that some of the ones on this raceme have already been plucked by the birds even as some at the tip are still green. Northern Mockingbirds, in particular, love these berries and do daily battle over them. The berries were highly prized in earlier days as a source for dye or for use as a red ink. It was sometimes even used to help color wine, a chancy practice since the berries, too, are poisonous for humans. Today, the plant is prized mostly by habitat gardeners like me and by those adventurous souls who like to live on the wild side and pluck their food from Mother Nature's own garden, the descendants of Poke Salet Annie. Do you ever make gardening mistakes? Indeed, is there a gardener alive who has not made mistakes. For some of us at least, it is chiefly the way we learn. 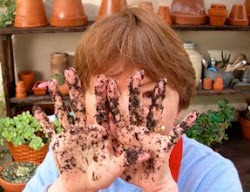 But surely I must be the Queen of Mistakes when it comes to gardening. I mean I have made some real whoppers over the years. It's unlikely though that any are worse than the one I made this spring. I was at the largest nursery in the Houston area, one which has branches all over town and in the suburbs. (It shall be nameless here, but anyone who lives here will know to which one I am referring.) I was picking up several plants to fill in gaps in my garden and I saw this table of healthy looking vines - pipevines, in fact. I wanted a pipevine to replace mine that had died the previous year, so I got one. I am unable to locate the label that was in the pot but my recollection is that all it said was Dutchman's pipevine. It was a really nice plant and I brought it home and introduced it to its new home, and boy, did it like it here! It grew like crazy. I kept looking for it to bloom, but it never did. Until last week. I noticed these swelling buds on the plant. I included a picture of them in my Bloom Day post. My lovely pipevine - just about to bloom. After I took that picture and looked at it later, I began to have some misgivings. It didn't quite look like the buds of the pipevines I had grown previously. Then the buds opened and I knew something different was happening here. My Dutchman's Pipe vine in full bloom this week. Uh oh, I thought, that really is not what I was expecting. 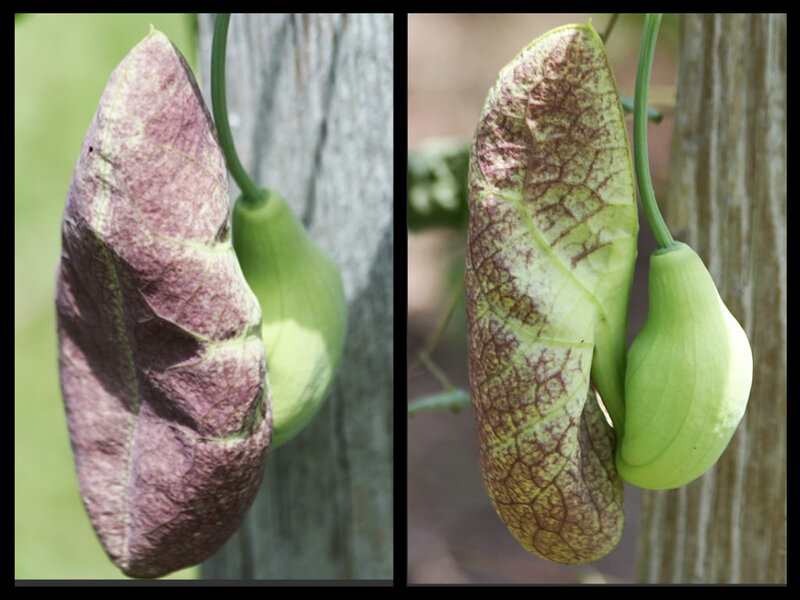 I turned to my friend Google for information and that's where I learned that the plant I had purchased was Aristolochia gigantea, not Aristolochia tomentosa or A. macrophylla. I had not even been aware that A. gigantea existed here - or at all, for that matter. It is a native of Brazil, and here's the kicker: In spite of its exotic beauty and its relationship to our native pipevines, its leaves are deadly to the larvae of the Pipevine Swallowtail butterfly! Now, the only reason I had bought the plant for my habitat garden was to serve as a host plant for the Pipevine Swallowtail, but inadvertently, through my ignorance, I had given any swallowtail larva that hatched on the leaves of this plant a death sentence. For, unfortunately, the Pipevine Swallowtail female cannot discern the difference and she will lay her eggs on it, thinking it is an appropriate host plant. I do have Pipevine Swallowtails visiting my garden, though not in as great numbers as previous years, and I checked the leaves of the plant but did not find any eggs or small larvae, so perhaps it is not too late. Now, I have to do one of the most distasteful things a gardener ever has to do - pull out and destroy a perfectly healthy and beautiful plant. All because I made a stupid mistake and was not as careful in my purchases as I should have been. Mea culpa and one more lesson learned. Hamelia patens. You can see why one of its common names is "Mexican firebush." Another of Hamelia's common names is "hummingbird bush." It's very popular with those little birds at this time of year. The Anisacanthus wrightii or "flame acanthus" had mostly finished its latest bloom cycle and, since it had gotten so big and sprawling, I cut it back about one-third in order to encourage more fall blooms. There are still a few stray blossoms left and they still attract butterflies like this beautiful Giant Swallowtail. Water lilies in the little goldfish pond are still blooming and their "pads" now shade most of the pond. The warm - make that hot - summer sun has enticed these goldfish out from the shade provided by the lilypads to bask. The weird and wonderful blossoms of the Dutchman's pipe vine are almost open. This pink purslane positively loves the sun. The blue blossoms of Cape plumbago seem particularly attractive to sulphur butterflies of all kinds. Do they realize how pretty their yellow looks against the blue? I'm not entirely sure what this plant is. It was a "volunteer" in a pot that I brought home from the nursery. It looked interesting so I dug it out and planted it in the garden and found that butterflies, particularly the Gray Hairstreaks like this one, just love it. Possibilities for the plant's identity include marsh fleabane or camphor weed. Thanks to Carol of May Dreams Gardens for again hosting this monthly meme and thank you for visiting my garden. Happy Bloom Day!